Do not overmix; leave plenty of chunks throughout. To store, cover the guacamole with plastic wrap, ensuring that the plastic comes in direct contact with the dip. Supposedly, authentic guacamole uses red onion, does not contain any garlic, and uses jalapeno in place of serranos. I use lemon in place of lime. 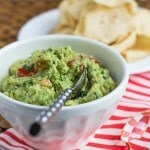 You will love this guacamole! !